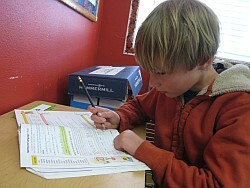 Older kids encompasses 4th and 5th grades. Reading at this level is the ability to decode words and access background knowledge so as to make sense of those words. Reading is taught through a workshop model. Our students are introduced to word attack strategies and review comprehension strategies in mini-lessons. They then discuss and explore these strategies in both small and large groups. They read across genres in self selected books and are challenged to read 40 books over the course of the school year. In addition, the entire class reads and studies several class novels throughout the year. We explore literature together to have our students practice the big questions of life by exploring them in novels with us. Both our fiction and non-fiction studies are integrated with topics being explored in science and/or social studies. Rivendell older kids, as do the rest of the school, study science and social studies on a four year rotation. In older kids we focus on immersing our students in the scientific process. Rivendell kids are natural questioners who are constantly asking why. In social studies we strive to help our students develop civic skills and an understanding of different perspectives that are fundamental in a democratic society. We ask students to examine their thoughts, feeling and actions in relation to each other and their school and community as a whole so as to develop into active and engaged citizens. We understand that knowledge and understanding are acquired through active exploration, so during our topic work children do not just sit and listen, but they actively engage in discussion, investigation, and questioning. Our children constantly ask how does what I am learning relate to my experiences, thus furthering their understanding and knowledge of themselves and the world. For each unit students demonstrate their knowledge of the subject through a recitation. Recitations are a project completed at home over a three week period and presented in class. This activity allows for creativity and choice while helping students learn the important skills of time management. Our students also have teachers for the following subjects: technology, art, music, science and engineering, Spanish, and P.E.